Westbridge Commercial have been working with the landowners of the land to the North of Arden Rd at Arden Forest Industrial Estate for the past four years. In April 2017 an outlined planning consent was granted for 20 acres of development land with B1, B2 and B8 planning permission. 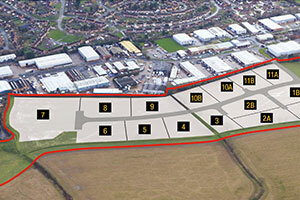 The landowners have entered into a joint venture with Graftongate, one of the country’s leading commercial developers who will be delivering new build Industrial Units from 5,000 - 150,000 sq ft on a design and build basis. Westbridge Commercial are the sole agents and have an number of interested occupiers in the site and have agreed terms on the first two buildings with the developer breaking ground in early 2019. For further information please contact Richard Johnson on 01789 415628.